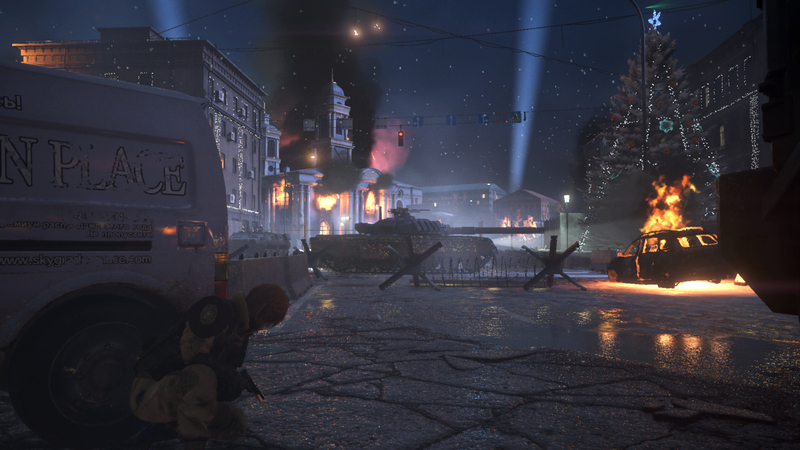 Of late, Square Enix has been a little more forthcoming with Left Alive information. This time, gameplay takes the hot seat. During a recently released gameplay trailer, stealth, combat, and player choices are all shown off. From the looks of things, it seems players will get to tailor their gameplay experience to personal preference. Olga, Leonid, and Mikhail, Left Alive’s three playable protagonists, all appeared in the trailer. Olga moved about stealthily for a while. Yet, it seemed that, should the player choose, she could also resort to gunplay-centric combat encounters. She’s also shown rescuing imperiled civilians and guiding then to safe shelters. Mikhail’s section of the trailer is where player choices were shown off. During an enemy encounter, three actions/dialogue choices appeared: “Don’t Shoot!,” (Pick up the gun), and “Shoot me!” If the “Don’t Shoot!” option is selected, the enemy combatant will fire a shot at an injured ally of Mikhail’s. The “Shoot Me!” selection showed Mikhail stepping in front of his comrade. The outcome for this option doesn’t play out in the video, and the trailer didn’t reveal what happens if the player character picks up a weapon. Player decisions seem like they might impact gameplay. In both Mikhail’s and Leonid’s sections of the trailer, choosing stealth over combat appeared to yield different results. Most of the focus in this regard featured in the moments that looked at Leonid. In one instance, Leonid passed a group of enemies undetected by distracting them with throwable objects. An alternate version of the same scene featured him directly engaging in combat and drawing the attention of other enemies. Left Alive will release for the PlayStation 4 and PC on March 5, 2019 in North America and Europe. It will launch in Japan a week earlier on February 28, 2019.